It was quite an occasion which commanded the attention of the entire nation. It had an audience surpassing all expectations! Time magazine said of it that "the crowd that swarmed in 200,000 strong making it the biggest political rally in U. S. history." Other publications gave higher estimates of those in attendance: Newsweek reported 250,000 and the Indianapolis Star estimated the crowd at 215,000. The final figure may never be known, but these was undeniably a crowd of gargantuan proportions. It was an orderly crowd with only 18 arrests being made which were of minor offenses such as drunkenness and pick pocketing. In June, 1940, when Wendell Lewis Willkie received the Republican Party's nomination for president, he decided to return to his hometown of Elwood, Indiana, to make his formal acceptance speech. The designated date for the "Notification Ceremony" was finally arrived at was August 17, 1940. The ceremony was to take place in Callaway Park, located in the northeast corn of Elwood. The spacious and well-manicured park was deemed adequate to accommodate a crowd of fifty thousand or so. No one, included event planner, Homer Capehart, could have foreseen the mass of humanity that descended upon Elwood. During July, signs and banners were hoisted all over town. A popular one was "Elwood, Ind. Home of Wendell Willkie Our Favorite Son." Actually this one was on a large billboard that stood at the intersection of State Road 28 and State Road 37 on the east side of Elwood. Those traveling from the east could easily see the sign and remember it as they proceeded downtown. Included in the events of the month were Willkie rallies that also drew people downtown. The Willkie appearance was announced in the August 5 edition of the Elwood Call Leader. Capehart had already been named chairman of the event by the GOP and, though working with Bonham, he was clearly in charge. Rumors of the expected large crowds began swarming around town. However, because Elwood was not a major city, most people were not expecting a large turnout. Some thought that 50,000 people would be a challenge for the city police force. Some plans had begun to be formed. For example, it was decided that in order to keep traffic flowing during the parade, no automobiles would be permitted on the streets on the day of the notification ceremony. All traffic would be routed into great parking lots near Callaway Park. Newsweek later reported that a total of sixty thousand cars came to Elwood, "which, bumper to bumper would have stretched 120 miles." Besides the large parking lots, several areas throughout the town were reserved for bus parking. Several dignitaries would be allowed a car, but they would have a sticker that indicated that they were "Official," "Press," and "Guest". These were allowed only on certain streets. It had been rumored that many, many important people would be in Elwood for the big day. One such notable was John Charles Thomas, the famous tenor from the Metropolitan Opera, who sang Irving Berlin's "God Bless America" at the ceremony the next day. Many other notables were mentioned. Someone even had said that Clark Gable and Carole Lombard would be in town. (That rumor turned out to not be true.) However, "Shipwreck Kelly," the famous flagpole sitter of the 1920s, was in Elwood all day on August 17, sitting atop a flagpole on the Kroger Building. That evening of August 16th, people had descended upon downtown Elwood where a special meeting and program took place on the steps of Willkie's old high school. One could hear music, laughter and occasionally cheering filling the quiet, very warm, and humid night. A popular NBC broadcaster, Walter O'Keefe, was on hand and there was original songs and poems contributed by Willkie enthusiasts. Some folks worried that rain might come ruin the big event of the day. As it turned out rain held off until the next afternoon. On the morning of August 17th, Elwood citizens and guest awoke to another muggy and hot day. There were no more neat, clean and orderly streets and yards. Cars were sitting everywhere except on the streets and bed and cots were in people's yards. Many residents had rented out rooms to the out-of-towners while the owners themselves slept in the yard. There we make-shift stands with all sorts of items for sale, mainly food and souvenirs. Ice water was going for five cents a glass; the same amount could buy you a Popsicle or a bottle of Royal Crown Cola. By 11:00 a.m., thousands had already gathered at Callaway Park in anticipation of Willkie's arrival and the beginning of the ceremony. Many folks had come the night before in order to get choice seats and by 5 a.m., 26,000 cars had already arrived. Ushers were on hand to help. From the 92 Indiana counties came 1,200 young men and women to participate in this event. Where had all these people come from? Alexandria reported that nearly half its population of 5,000 attended and forty thousand came from Indianapolis. Crowds also came from Chicago, Illinois and Akron, Ohio. Perhaps the most distinguished of all was Paul Benjamin who bicycled 2,776 miles from the University of Washington in Seattle. By noon the weather had become sultry, hot, still, humid and "close''. Many people were becoming increasingly uncomfortable. As people moved about, they were trying to take pictures of the stage, the park, and the crowd. At about 2 p.m., Willkie's train from Rushville had stopped at South J and Twenty-second streets. There he waited for an hour before getting into his special car that took him over to Anderson Street and downtown Elwood. Life magazine photographer, John Collins, took the picture at right with Willkie standing in the car with his hat in hand. 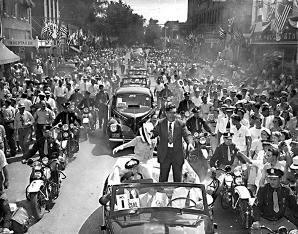 The caption in the magazine: "Here in this superb campaign picture you see Wendell Willkie, Republican nominee for president, riding into Elwood, Ind. to deliver his acceptance speech on the aftern9on of August 17. Here is a diorama of America's electoral system, the candidate standing informally in an open car, the people swarming on either side, the cops, the flags, the dust and over all the shimmer of deep summer heat. This is the pageant of American politics. Willkie's speech was not very well received by many people it seemed that he offended some isolationists who were very strong in the Republican party. In the speech, he did agree with the president in his support of aid for Great Britain which would later be called the Lend-Lease program. However, Willkie seemed to oppose Roosevelt on almost every other matter and challenged him to an open debate. In the end, Roosevelt chose to ignore the challenge to debate. The "sea of humanity" was mostly gone from Elwood by 6 p.m. According to the papers, Capehart had made a hasty exit. However, the citizens of Elwood began work immediately to put things back to normal, with work crews clearing the streets and hauling tons of debris off to the city dump. Overall the day was deemed a great success. One newspaper headline read Police Praise Elwood Crowd since there were so few arrests. Bonham commented: We are all happy both for ourselves and for Wendell Willkie that everything went off so well. The same newspaper article stated that Elwood's citizens feel unanimously that 'We put it over and it was a success.' Next thing to come, they like to believe, will be some sort of celebration when their native son is elected President. Alas for Elwood, Indiana, this was not to be. Source - (1)Traces of Indiana and Midwestern History - Summer 2009. (2)Research done by Madison County Historian, Stephen T. Jackson.